Octavian Droobers hosted the second West Midlands League at Hartshill Hayes, nr Nuneaton, on Sunday and organiser Chris McCartney, with a band of helpers, was pleased with the high turnout of 315 competitors from around the midlands. 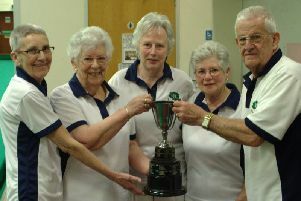 The great performances from the home team of nearly 80 members pushed the club into top position with 2830 points well ahead of nearest club Harlequins Orienteering Club, from Worcestershire, 2208 points. The fastest runner on the day on the longest Brown course was Nottingham Orienteer Peter Hodkinson M21 who completed the 6.9km course with 190 metres of climb in a brilliant 40.12mins, Harrison McCartney M18 was 2nd in 47.22mins, Mateusz Podsiadly M21 4th in 56.57mins, Chris McCartney M45 5th in 57.20mins and Kirsten Strain W21 was top woman taking 59.05mins. Top club runner on the Blue course was 4th placed Barry Elkington M60 who took 51.43mins on the 5.6km course only 2mins behind the winner Richard Pay from Wrekin Orienteers and Andy Emmerson M60 was 5th in 54.42mins. Oliver Lunn M14 was 1st on the most popular Green 4.3km course finding 17 controls in 42.09mins and Oliver Flippance M14 was 3rd in 43.52mins. Droobers took top 4 places on the Short Green 3.2km course, with Bruce Bryant M55 1st in 31.08mins, 2nd Richard Gardner M60 36.55mins, 3rd Peter Carey M70 40.39mins and 4th Mike Hampton M70 41.02mins. Kerrie Flippance W40 was 4th on the Light Green 3.6km course in 57.24mins and new members Hannah Matthews W16 and Catherine Beattie W16 were 5th in 63.14mins on the same course. On the Orange 2.5km course Florence Lunn W12 was 1st in 37.01mins, Tabitha Lunn W12 2nd 39.09mins and Finley Flippance M12 5th in 48.49mins. Kenilworth School Christian Roberts M12 was 1st on the Yellow 1.8km course in 13.23mins and newcomers: Julia W12 and Tim Hill were 3rd in 17.27mins and Sophie W12 and Ulrike Hill 4th in 19.25mins, Josie Smart W12 was 5th in 20.15mins. Tilly Flippance W8 won the White 1.2km course in 10.58mins, new members Jennifer W10 and Sharon Beattie 3rd in 12.48mins and Max Straube-Roth M10 was 4th in 15.30mins. The next event takes place at Daventry Country Park on Saturday, February 6, with starts from 10am until 12noon. It is scheduled to follow on after the weekly Park Run at the same venue. Organiser Tom Jeffries has planned several courses, of varying lengths to suit beginners as well as experienced orienteers. The club extends an invitation to runners and walkers of all ages, 5 – 85 years, to try out this fun outdoor adventure navigation sport. Help is available to all newcomers. A large scale map and electronic timers are provided; bring a compass if you have one. To find out more see website www.octavian-droobers.org or call (01926) 632189.